I'm excited to announce, we have released a new version of our RSA audit tool. 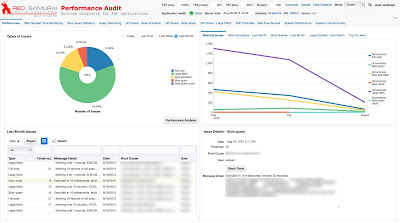 This is a major update after previous version released in February 2015 - Red Samurai ADF Performance Audit Tool v 3.4 - ADF Task Flow Statistics with Oracle DMS Servlet Integration. 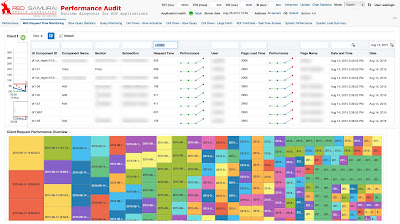 It is already 3 years, since initial version - Red Samurai Performance Audit Tool - Runtime Diagnosis for ADF Applications. 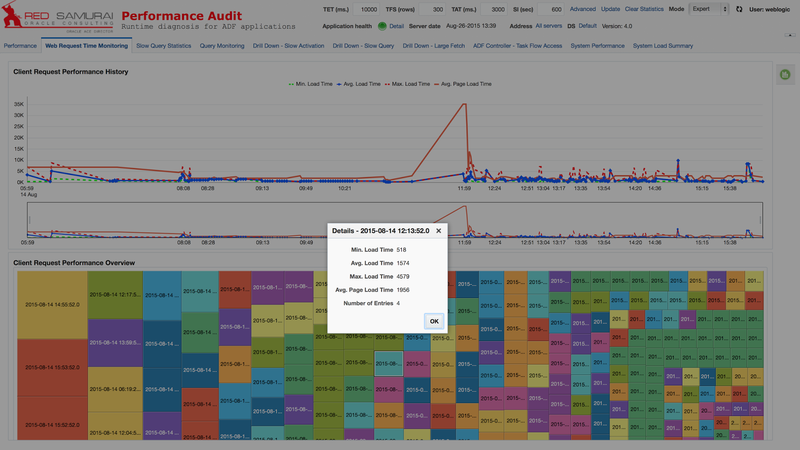 We are using it for many of our customers to monitor ADF performance in both test and production environments. Many new features were added during these years, more features to come. We are using this tool in the version 3.5.1 and planned to move to the new version asap. This tool is the perfect and best one you can use to understand your ADF applications (views and AM usage, queries, etc.). It helps us a lot for improving our application performance and also to control effects (good and bad) of new developments. Andrejus, thanks a lot for this tool and your support! RSA Audit is for us an easy to use "eye-opener" on ADF apps behaviors. It helped and is helping us to quickly identify performance issues (including for those you sometime don't suspect) and sort them out. Thanks for this great added value to any ADF dev effort. Keep it up ! We are using RSA Audit Tool version 3.2 on WLS 11gR1. Our company is still in the development stage; converting from Oracle Forms to ADF. 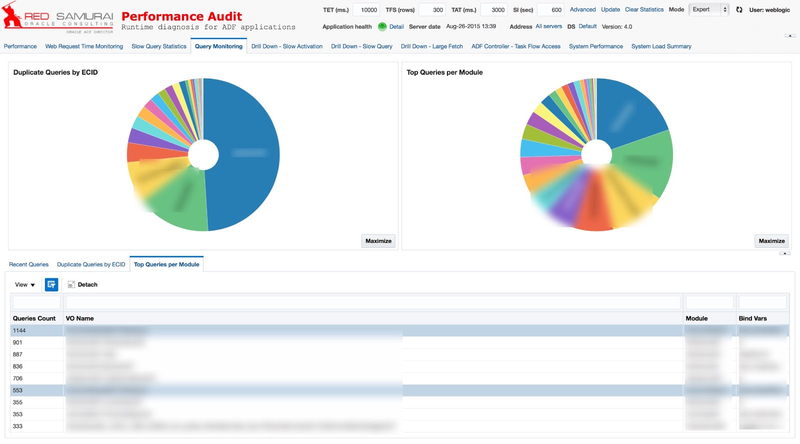 We are finding that the audit tool is most beneficial in highlighting queries that are a problem. These problem queries either take too long to execute or retrieve too many rows. 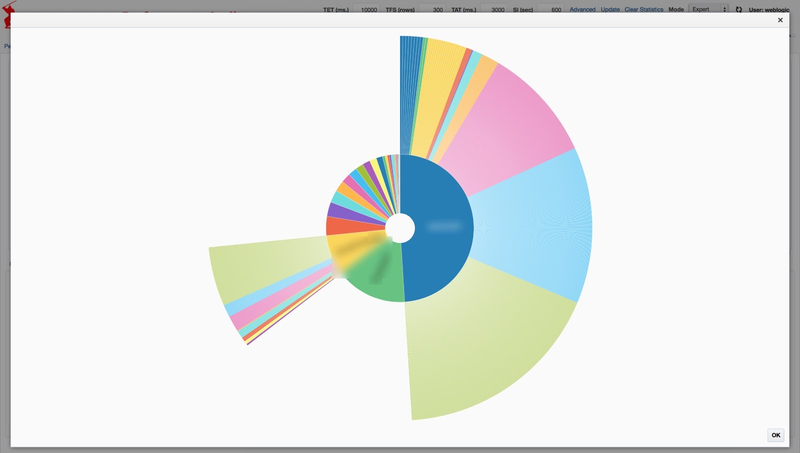 The visuals make the product easy to see trends. We are approaching a stage where installing the audit tool at the beta site is going to reveal its true potential. Thanks to the Red Samurai Team for a wonderful product. Hi thanks Andrejus for this release. It's worthwhile mentioning, that we continue to use this tool in all of our ADF builds. We work with large and complex data sets, sourced from Oracle e-Business, and we depend upon this tool in the early and late stages of our builds. It's helped us out in a couple of critical situations, whilst giving us a handle on exactly what the page is doing. Thanks again, and will provide feedback on this latest release. so far we have implemented many changes based on the findings (e.g. large fetches from the database, slow queries). Many thanks to Andrejus and his team for this tool and their support. We are using this tool, both in production and also during development. 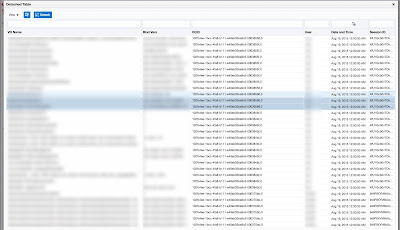 Our product is a large ADF application with ~400 taskflows, utilizing UIShell from Oracle. RSA Audit tool has been an integral part of our product since version 2.6, and has really helped us a lot finding performance issues. 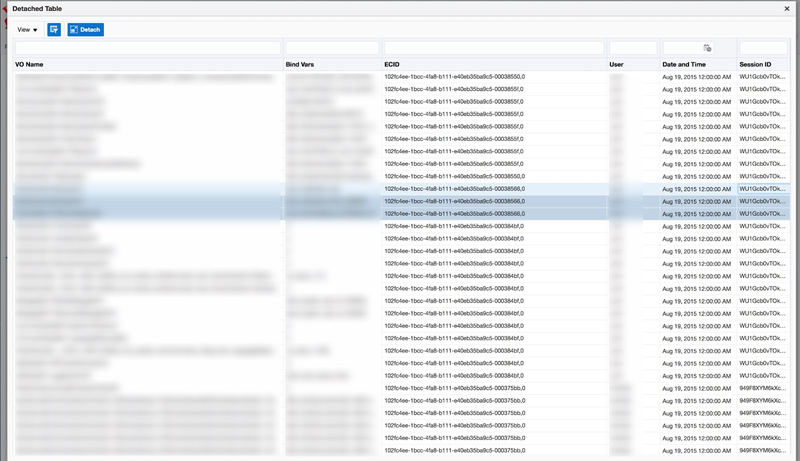 By using this tool as an integral part of the application, we have a common reference when sorting out performance problems with our customers. Internally we have a single RSA database installation which collects data from all our development- and test environments. So the possibility to differentiate log-data from individual servers is essential - and Andrejus was quick to implement this feature when we requested it! This tool just gets better and better for each release! Thank you Andrejus, for providing the ADF community with such a great tool - we really appreciate it! We are using RSA for a long time ~ 2 years. It is a big tool to support our ADF aplication, it has-been helping us to improve increase in terms of performance, tuning IN, task flows, VO, EO, fetching, slow queries, monitoring health status, ... everything you need to Control ADF our Aplication. We are grateful to Andrejus and REDSAMURAI team for helping us with this fantastic tool. I think it is most great and perfect tool developed for ADF. Without your tool, it will be not possible to develop professional applications based on ADF technology. Your tool helped us a lot in the past and would help us in the future. Thanks a lot for keeping it up to date and make it more robust and perfect! Thanks for the new version of this tool. For any serious production web application, being able to instrument the application and then analyze the use and performance of it should be a mandatory practice for all web development shops. We have been using this tool on our application for the last few years and it has helped immensely in improving the performance and stability of our application to a global audience. 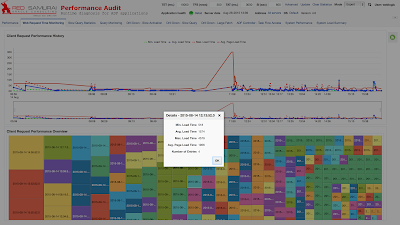 In any large ADF application, the ability to drill down to specific view objects that may be causing an issue or look at historic data to spot trends is a lifesaver. I'm looking forward to utilizing this next version of the tool in the next few weeks. We have been using the AS Audit Tool for a couple of years as part of our project to migrate from Oracle Forms to ADF. It has been invaluable in helping us to track down various "misbehaving" components that affect performance. 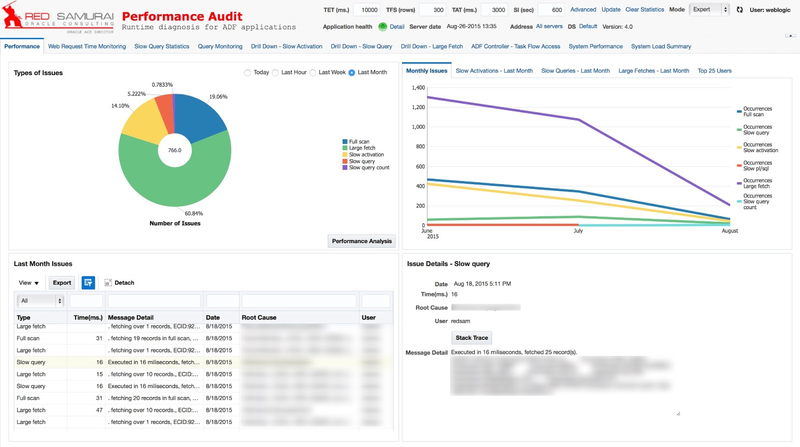 Prior to using the Audit tool, it was a very manual process to track down performance bottlenecks...now they are glaringly obvious. This should be part of everyone's ADF project.